Lightning, while beautiful, can do significant damage to your home. Lightning can be beautiful to watch, from a distance. There is a long list of problems that can come with lightning, however. First, the loud boom after lightning can scare your pets, making them difficult to find. Be sure to keep an eye on your pets to make sure they aren’t frightened or running. There is also the danger of your home being struck by a lightning bolt. Atmospheric electricity can seriously damage your home; it could also cause a fire as a result of the surge of electricity. 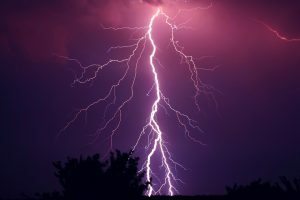 To help you prevent a lightning fire on Long Island, Branch Services wants to give you some quick advice on the dangers of lightning strikes and how to prevent lightning strikes in the future. What Happens When a Lightning Bolt Strikes a House? Lightning is an electrical discharge caused by imbalances between storm clouds and the ground, or within the clouds themselves. During a storm colliding particles increase the imbalance between storm clouds and the ground, causing lightning to strike the ground in an attempt to negate the imbalance. Searching for the shortest distance to the ground, large trees and houses are especially vulnerable to lightning strikes. When lightning strikes a house it can go through electrical lines, water pipes, phone lines, or anything that can conduct massive amounts of electricity. There are three main dangers you should be prepared for if lightning strikes your home. One of the most complete ways to prevent a lightning fire is to invest in a protection system to be installed by a professional. Electrical rods can direct the surge of power to the ground and away from your property. You should also be sure to unplug all electrical devices to avoid having surges damage your gadgets and gizmos.